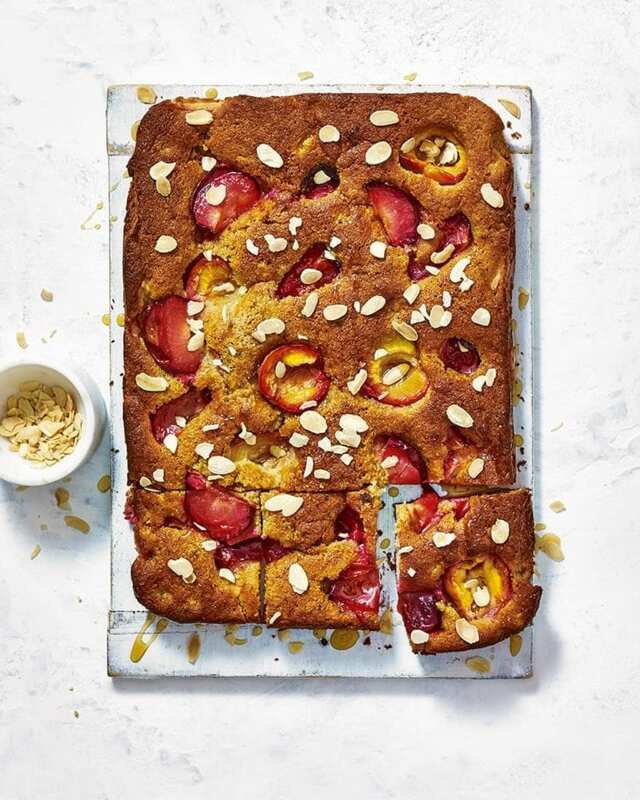 Your sweet treat with a cuppa just got more saintly with this moist and fruity almond and plum cake. How did we do it? We cut down on the butter and sugar and added apple sauce for sweetness and extra texture. Heat the oven to 180°C/160°C fan/gas 4. Using an electric hand mixer, whisk the butter and sugar in a large mixing bowl until pale and fluffy. In a jug, use a fork to beat the apple sauce with the eggs and vanilla extract until just combined. In a bowl, mix the ground almonds, flour, bicarbonate of soda, baking powder and salt. Whisk one-third of the egg mix into the butter and sugar until just combined, followed by one third of the dry ingredients. Repeat until all the wet and dry ingredients have been added. Fold in the chopped plums using a large metal spoon, then pour the mixture into the cake tin and level the top with a spatula. Arrange the plum halves/quarters on top of the mixture, then bake for 30-35 minutes until risen and golden. Put the cake in its tin on a wire rack to cool, then transfer from the tin to a board, drizzle with honey and scatter with flaked almonds to serve. Replace the plums in step 2 with peaches, nectarines or whole blackberries. Make one day ahead and keep in an airtight container somewhere cool.